A massive line-up for Reggae heads as a trio of incredible bands come to spread the positive vibes this Summer! That's right – Rebelution, Stephen Marley & Common Kings are coming to Gorge Amphitheatre on Saturday 18th August 2018! A perfect performance under the summer sun… come soak up the action by booking your tickets well in advance! There's no time like the present! The record is well known for it's socially conscious lyrics and uplifting vibes and it's hit single "Safe and Sound" took over the radio stations, on constant repeat, via San Diego’s 91X and Los Angeles’s KROQ and even on iTunes… And was titled Editor’s Choice for Best Reggae Album of 2007! as well as smashing the No. 4 on Billboard Top Reggae Albums charts – it was clear these guys were off to a good start! 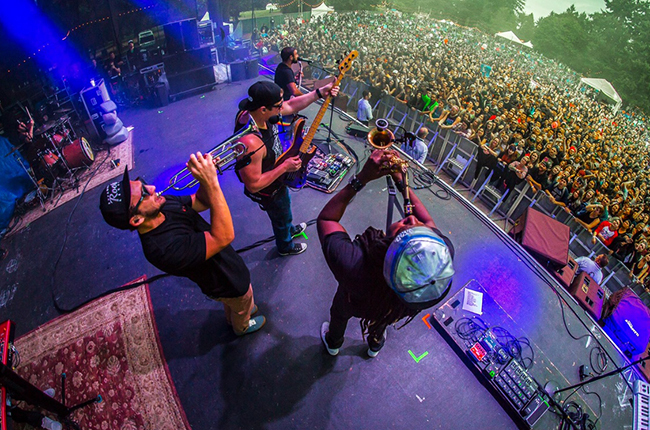 "One thing that makes Rebelution a more prominent act is their bombastic stage presence. From the very beginning, they were exploding with excited energy and blazing riffs. As a live experience, they sound so much fuller, brighter, and more detailed somehow." "As it stands, this has been my favorite show of the year so far. This one sets the bar very, very high for all other shows to come. Don’t miss these guys if you get a chance to see them, especially if you haven’t seen them before!"